Dr. Karol Watson, from the UCLA school of medicine, and heart attack survivor and health advocate Eliz Greene, discuss high cholesterol’s role in many common and serious health problems – including heart disease and stroke. Currently, Karol E. Watson, MD, PhD is director of the UCLA Barbra Streisand Women’s Heart Health Program at UCLA, Co-Director of the UCLA Program in Preventative Cardiology, and director of the UCLA Fellowship Program in Cardiovascular Diseases. Dr. Watson’s more than 100 publications and presentations have addressed many subjects including prevention of heart disease, vascular calcification, hormone replacement therapy, the metabolic syndrome, hypertension, hypercholesterolemia, and. cardiovascular disease in African Americans. She holds the John C. Mazziotta Term Chair in Medicine and was honored to be named Cardiologist of the Year, by the California chapter of the American College of Cardiology (ACC) in 2017. Eliz Greene was seven-months pregnant with twins when she suffered a massive heart attack. Her heart attack forced her to slow down and pay attention to what was important. Her life changed — not only did she survive a ten-minute cardiac arrest, the cesarean delivery of her daughters and open-heart surgery, all on the same day — she gained a new perspective and passion for life. Determined not to lose her new-found passion and to regain her health, Eliz developed strategies to fit activity and healthy habits into her life. She lost the more than eighty pounds she gained while pregnant and has kept it off for more than a decade. She was recently named one of the Top Ten Online Influencers on Stress and is the Heart Disease Expert on Answers.com. Neal Howard: Hello and welcome to the program. I’m your host Neal Howard here on Health Professional Radio, glad that you could join us once again. Now while you can’t see or feel high cholesterol, it can potentially lead to many common and serious health problems including heart disease and stroke. 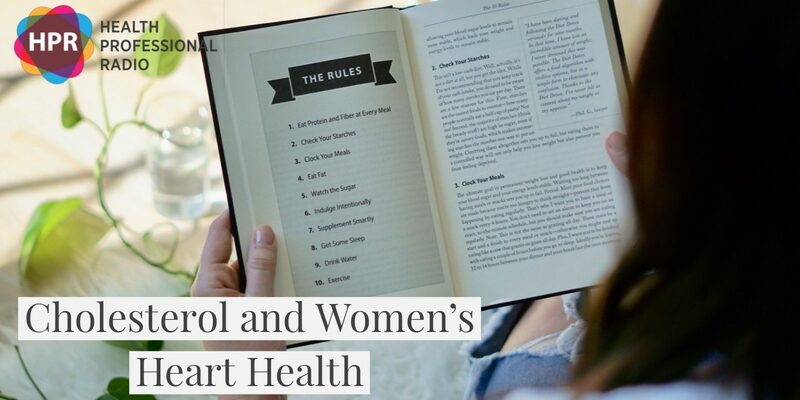 Here to share what you really need to know about keeping your high cholesterol in check, our cardiologist Dr. Karol Watson from the UCLA School of Medicine along with heart attack survivor and health advocate Eliz Greene. Welcome to the program both Dr. Watson and Eliz Green. How are you both? Dr. Karol Watson: Great. How are you? N: Great. Thanks for taking the time. Dr. Watson, what exactly is high cholesterol for those listening who aren’t familiar with it? W: Cholesterol is a waxy fatty substance that’s in everyone’s body and it’s used for a lot of important things like making all of our hormones, like estrogen and testosterone and for maintaining all of our cells and making our skin look plump and healthy but we only need a very low level of cholesterol to do all of those functions. Anytime we get more cholesterol than that, that’s considered high cholesterol so we have to know that what our own individual cholesterol level is. It’s something we need to discuss with our doctors and if your doctor feels that your cholesterol is higher than its optimal, they’ll make recommendations about managing that. Things like diet and exercise and if that doesn’t work, a medication and the most common medication, is a Statin. Statins are great cholesterol-lowering drugs and they’ve also been shown to reduce the risk of heart attack, stroke and dying of a cardiovascular disease. Someone on a Statin and their doctor tells them that it’s that important, you need to stay on their Statin. Despite that, we have data that shows about 50% people who are first prescribed a statin will stop taking it within the first year. N: Why is that? Doesn’t it help them, why do they stop taking it? W: Yes, it’s a great question. One reason is people don’t always understand why they’re taking it. I think if they understood the reason and their risk of not taking it, they would stay on it. But another reason is high cholesterol is asymptomatic. They don’t usually feel anything, so people aren’t sure why they’re taking the medication. And finally there are some people who end up having side effects from statins and they instead of talking to their doctor, they just stop the drug. One of the reasons I’m so excited to be involved with this current ‘Take Cholesterol to Heart’ campaign because we’re getting out the information to people. Tells them what statin therapy does, this is why it’s important and if you have an issue, here are some questions you can take to your doctor to discuss the statin problem if you’re having it. There are seven different statins on the market so if you can’t tolerate one I’m certain your doctor can find another one that you can so don’t just stop your statins, talk to your doctor. N: Why is it that you have to find out whether you have the right amount of cholesterol? What causes the amount to be higher or lower than it should be? W: Interestingly about 75% of the cholesterol in our bodies is genetically determined. That means your genes decide how much your body should turn out in cholesterol and that level genetically, that’s why families tend to have high cholesterol together. But about 25% and something that you can manage, it’s your diet, your exercise, your weight, things like that. Most of it genetically determined, some of it though you have control over it. It’ll fluctuate depending on if your diet’s worse or better and if it’s depending on whether you’ve gained weight or lose weight, a lot of things. N: Now Eliz, I understand that you survived a heart attack. E: My heart attack was caused by my pregnancy. I was 35 years old and seven months pregnant with twins when I had my heart attack and fortunately I had great care right away. So I’m well, my daughters are 17 and doing well but what that means for my health is that since I’ve already had a heart attack, I am at significant risk of having another. So I really need to pay attention to all of my heart disease risk factors – my blood pressure, my stress and my cholesterol to make sure that that doesn’t happen. I’m really on a mission to make sure other people do the same thing which is why I’m so delighted to be partners with Kowa Pharmaceuticals America for this education campaign, ‘Take Cholesterol to Heart’ and there’s a great website takecholesteroltoheart.com and on it is a discussion guide I think that’s one of the best things. There’s lots of wonderful things on the website but one of the best things is this discussion guide to collect the information, think about what you need to talk to your doctor about when you go into that appointment. Because it’s been 17 years from since my heart attack, having a great relationship with my doctor I believe is one of the reasons I’ve done so well. N: Dr. Watson, Eliz is talking about this great relationship. With so many different treatment options and management options out there and so many people ignoring their medicine after a year or so. How do you form that relationship? How do you get that conversation started about the importance with your patients? W: That’s a great, great point. The first thing I try to do is make a direct connection between a high cholesterol, heart attack and stroke. Many people think it’s just, “Oh the number looks bad, my doctor gets angry.” They don’t realize there’s a really direct connection between high cholesterol, heart attack and stroke. The second thing that people don’t realize is how well we can manage these levels now. Again statin therapy was a game changer and our ability to lower risk and lower cholesterol levels and then third I want people to understand if I took the time to write this prescription, I really believe you need it and so it’s definitely to stay on the medication and if there’s any problems, call me. N: Eliz, talk about how your heart attack affected your family and some of the support that you gained and once again give us the website where we can learn more. E: Sure. I had amazing support not only for my family but from the whole community but very particularly in the healthcare professionals that were taking care of me. I think drawing that line that Dr. Watson talked about between cholesterol and a heart attack but also between controlling our risk and really getting to experience the things that we want to experience with the people that we love. My girls are getting close to high school graduation, I want to be there for that. I’m going to control my risk factors, I’m going to take the medication I’m prescribed, I’m going to have that conversation with a doctor so that I get to have all those moments. N: Thank you both for taking the time. It’s been an absolute pleasure Dr. Karol Watson from the UCLA School of Medicine and Eliz Greene, a health advocate. Thank you both for joining us today. E: Thank you so much for having us. N: You’ve listening to Health Professional Radio, I’m your host Neal Howard. Transcripts and audio of this program are available at hpr.fm and healthprofessionalradio.com.au.